We know service and we think we provide a great service. We work really hard behind the scenes to deliver a lawn care treatment service we are truly proud of and it starts when our clients pick up the phone (or email) and contact us. When you request a free lawn inspection, you can expect a reply within 24 hours and a visit within a day or so of this. We always like to meet you on site for the first consultation so that we can explain what we do. 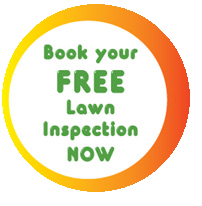 We inspect your lawn, let you know exactly what you can expect with each visit and also what we need you to do to help maximise the benefits of our lawn treatments. Your lawn is measured for size and then a quote is generated on the spot. With your acceptance, we can start treating your lawn immediately. If you are unable to meet us on site, don't panic, we can visit your property with your approval and call you while we are onsite to talk you through our findings. If you need more time, the quote is sent back to head office and a copy is emailed to you within 12 hours of our visit. Before we start treating your grass, we remove all obstacles on your lawn, wind up hoses, rake or blow leaves and be aware before we even start treating your lawn. As part of our Health and Safety 'best practices', we place a Safety cone outside your property to alert public work is being carried out on your property. We will always leave a calling card with some simple instructions to follow. Following this simple advice will help you to maximise the benefits of our weed and feed service. Our lawn care operators will always clean up after themselves. Fertiliser prills will be removed from decks and pathways using commercial blowers and edges are cut and tidied using our professional lawn edging machines before we leave your property. Our lawn care operators are all fully qualified turf applicators and we use the finest turf registered products available. We use State of the Art equipment delivering drift free applications which make it very safe for our clients and their pets, children and surroundings. Our team of operators carry out treatments to the highest possible standard. All our staff and franchisees have a real pride in their appearance. Our trucks are always clean and tidy and we know this gives our customers 100% confidence that we really do care - and is often commented on.